David Cronenberg’s adaptation of William S. Burrough’s beat-era novel, Naked Lunch, shows as much about the filmmaker as it does the author in subject. The novel was once thought unfilmable, filled with hallucinatory sequences of drug induced illusions and paranoia. Rather than tackling the film head-on, Cronenberg splits the screen-time with a focus on a character based on Burroughs as he writes his novel in a drug-addled stated. The result is an examination of the act of creating a work of art, along with drug addiction. All of this is done with consideration to the story within Naked Lunch, inserted during the illusionary drug-induced state, and with the distinct visual style and themes of the Canadian horror director. Cronenberg’s films all seem to share a common fascination with the mutilation and metamorphosis of human flesh, particularly in terms of technological advancements. In Videodrome it is a living, breathing videotape. In Naked Lunch the typewriters are alive, talking alien bugs, agents in a sinister plot involving exterminator and drug addict Bill Lee (Peter Weller). All of the problems arise when Lee accidentally shoots his wife, leading to a series of drug induced delusions. As he travels to a nightmarish world called Interzone to escape his accidental crime, Bill meets a woman identical to his wife and a espionage plot that he becomes involved in. What remains at the end of this trip is the writings that Lee does, as his official reports ordered to him by a giant bug. 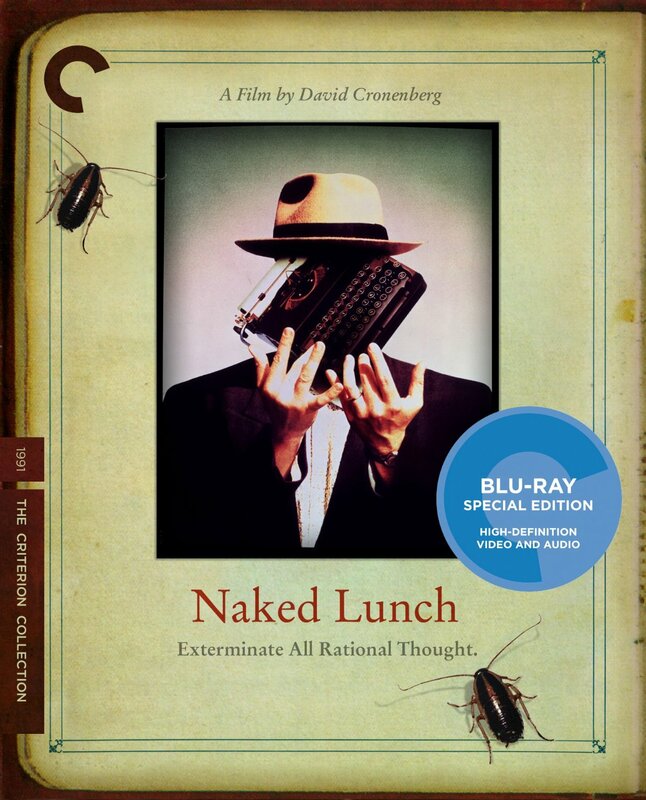 The Blu-ray release of Naked Lunch has a high-definition digital transfer and DTS-HD Master audio soundtrack, approved by Cronenberg, who also provides a commentary track alongside Weller. Also included in the special features is the 1992 making-of documentary by Chris Rodley, Naked Making Lunch and an audio recording of Burroughs reading from the novel. There are also galleries of photos Allen Ginsberg took of Burroughs, as well as a marketing gallery and one of the special effects artwork and photos. The package comes with a 40-page booklet with reprinted pieces from film critic Janet Maslin, novelist Gary Indiana, filmmaker Rodley, and Burroughs.